I was reminded last week as I heard professor Guth’s talk on systoles for the 4th time (Yes, the same talk! –in Toronto, Northwestern, India and here at the IAS). It’s interesting that I’m often thinking about different things each time I hear the same talk. This one is about the generalized Geroch conjecture. Geroch conjecture: (the -torus) does not admit a metric of positive scalar curvature. The conjecture is proved by Schoen and Yau (1979). where is the Euclidian volume and is a positive constant only depending on the dimension . must vanish. Further more, the Riemannian structure on forces the term to vanish. Restatement of the Geroch conjecture: For all on , there exists some point s.t. .
Generalized Geroch conjecture: For any , for all , there exists s.t. . The flat torus, of course, has -scalar curvature at all points. For the regular rotational torus, we take the ball around the saddle point of the gradient flow, the ball look like a saddle, as shown below. To see that this has area larger than the analogous Euclidean ball, we can cut it along radial rays into thin triangles, each triangle can be ‘almost flattened’ to a Euclidean triangle, but we have a more triangles than in the Euclidean case. We have a few parameters here: the number of balls , the width of the connecting cylinders , the length of the connecting cylinders and the radius of each sphere . If cylinders are too long (longer than ), then we can just take the ball in the middle of the cylinder, the volume when lifted to universal cover would be equal to Euclidean. If the width of cylinders are much smaller than , then the ball around a point in the gluing line would have volume almost a full spherical ball plus a half Euclidean ball, which would obviously be larger than a full Euclidean ball. Hence the more interesting case is to have very short, wide tubes and as a consequence, have many balls forming a loop. 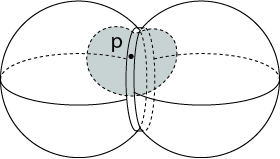 In this case, the ‘worst’ ball would be centered at the middle of the tube, it intersects the two spheres connected by the tube in something a bit larger than a spherical half-ball. I haven’t figured out an estimate yet. i.e. can the advantage taken from the fact that spherical ball are smaller than Euclidean balls cancel out the ‘a bit larger than half’? I think that would be interesting to work out. Let , by the generalized Geroch conjecture we have some larger than the Euclidean ball. i.e. This entry was posted on	October 25, 2010 at 1:22 am	and is filed under Uncategorized. There is also Gromov-Lawson’s proof of the G conjecture, I think.